The number of childless couples is growing in Russia, while families with multiple children stand out as unusual. In the 1968 Soviet film “Let’s Wait Till Monday,” a schoolgirl named Nadya states during class that her idea of happiness is to become a mother of four. This bold statement infuriates her teacher, who stands firm in her Soviet ideology. The film is now more than 40 years old; the country has transformed radically and people’s lifestyles along with it. Yet mothers with many children still face a wall of public indifference and even hostility, despite plummeting demographics and government incentive programs. It’s estimated that approximately 75% of marriages in Russia end in separation. Ten percent of those end after over 20 years of living together. But Ipatova is unique. There are fewer families like hers every year. Only 3 percent of all couples have more than two children and 48 percent, almost half, have none, according to statistics. Anna Kuleshova, 30, has three daughters: “There are a good many families with lots of children in our neighborhood of Chertanovo, and we always support each other. But when I venture outside our circle I hear torrents of abuse. People say we have no conscience, that we jump the queues everywhere, that we are lazy and we have children in order not to have to go to work.” Kulshova made the point that she has a doctorate in social sciences and went back to work when her youngest daughter turned just three months old. 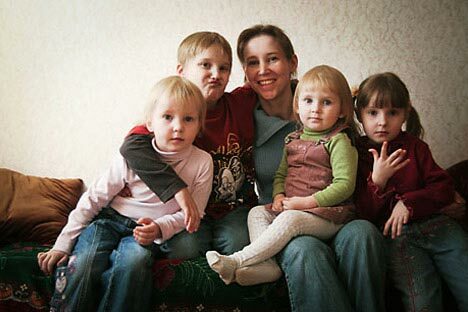 of Russian families have three or more children, while 48% of married couples have no children at all. marriages and 4.2 divorces occurred for every 1000 people in 1980, versus 8.9 and 4.8 in 2007, respectively. There is no data available on how many families with many children divorce (as opposed to fewer children), but overall statistics are grim. They show that while about a million marriages are registered in Russia every year, 700,000 couples divorce. That means almost three out of four marriages are collapsing. Psychologists and sociologists have long been sounding the alarm and talking about a “crisis” and even the “extinction” of the institution of the family. It is not only about divorce statistics, however. More and more couples live together instead of marrying, and prefer this to a registered marriage, something that was unthinkable in the Soviet years. Another recent trend among mothers is to have a child on their own, without a husband or partner: more than 30 percent of Russian children are born out of marriage, according to the latest data. Add to this a serious drop in births, and the future of the nuclear family looks bleak. The average number of children per family in Russia is 1.59, compared with 1.9 in 1990. Russia is still among the world leaders in terms of the number of abortions, and even late abortions. Sixty percent of pregnancies are terminated. There are many reasons for the decline in the birthrate. About 31 percent of Russians do not want to have children because of financial difficulties, as well as insufficient state support for families, according to VCIOM, the state’s official statistics organization. Combining a career with childbirth and raising children is another problem. One in every five young women between 24 and 35 is not prepared to marry and have a child because she wants to pursue a career. This is underscored by a shortage of kindergartens and the high rates charged by nannies. The state is trying to encourage young families to have more children, mainly by offering so-called “mother’s capital,” a check for about $12,800 (365,000 rubles) issued upon the birth of the second and third child. While the measures have led to a 22 percent increase in the birthrate since 2006, they have not been enough to fix the demographic crisis. Last year, United Russia, the ruling party, took a desperate step: The deputies of the Chelyabinsk regional government proposed reintroducing a childless tax that existed in the Soviet Union between 1941 and 1992. Childless men between 20 and 50 and childless married women between 20 and 45 were supposed to have 6 percent of their salary taxed until they gave birth to or adopted a child. Members of the State Duma also proposed to “fine” childless parents several years ago. However, a public outcry over the initiative forced deputies to drop the idea and promise to find more humane ways of combating childlessness. Still, innovative ways of encouraging family life seem to elude the state.